Fun concept – use a muffin tin as the form. Oops – I overbaked my crust a bit but still think these turned out cute. And, whether crust is a bit too done or not, they still taste great. I went with Jonathans in this recipe trial but any good baking apple wood do, including Honeycrisp and Haralson. You’ll need about 1 quart (4 cups) of raspberries for this pie. 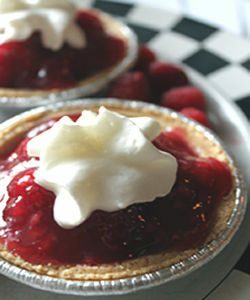 Recipe adapted from the French Strawberry Glace Pie in the Betty Crocker Picture Cook Book from the late 1950s. We made our pies in 3″ diameter pans. Maybe we’ll call them raspberry tarts. They are soo cute!!! Edith’s secret: Use a graham cracker crust instead of the baked pie shell in the original recipe. We simplified even more and used a store-bought graham cracker crust. Mix crumbs and sugar. Blend melted margarine into mixture. Press into pie pan on the bottom and the sides. I do not bake this crust. I use margarine because it makes the crust softer. Cool in the refrigerator. Soften 4 oz. of cream cheese. Spread on the bottom part of the pie shell. Return to the refrigerator. Wash and drain 1 quart of raspberries. Simmer together about three minutes (1 cup of the raspberries and 2/3 water. Blend and add to boiling mixture. (1 cup sugar, 3 tbsp. cornstarch and 1/3 cup water). Bring to a boil stirring constantly and boil 1 minute. Let it cool down. Put 2 ½ cups raspberries in the pie on top of cream cheese. (These raspberries you are using for the pie must be drained thoroughly. I put mine on a cookie sheet covered with paper towels. Water left in the little cup shape of the raspberries will make the crust soggy). Pour the somewhat cooled cooked mixture on top of the fresh berries. Cool completely. Serve with whipped cream and a few raspberries on the top. All the great taste of a pie and very easy to assemble. We love Ina Garten’s recipe from Foodnetwork.com. We’ve made this in the fall at the height of apple season and then in March with the apples we’d saved up from the harvest. Delicious every time! We skipped the food processor when making the crumb topping. We sliced the cold butter into 1/2″ cubes and cut them into the sugar + flour mixture with a pastry fork, working it by hand at the end. Less muss, less equipment to clean. Pleating the edges – Love that we get to make pleats. Small hands can help. Tip: Dampen a finger in water and use that as glue to hold the pleats together. Baking time and the edges – We found that it took a bit longer to bake the apples than the recipe described. 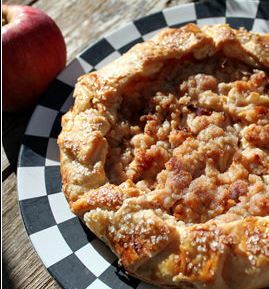 No matter what the timer says, keep baking the crostata until a toothpick shows the apples are tender. Note: To keep the pastry edge from getting too dark while the apples finish baking, we covered the edges with strips of aluminum foil. That was about 30 minutes into the baking process. 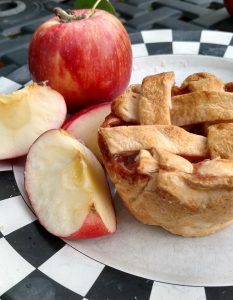 Whether labeled a tart or a crostata or something else, these open-faced pie recipes are tasty. The rustic nature of these desserts keeps the whole baking process from being intimidating. Looks messy? It is supposed to!! Go with thin slices of peaches and you can skip peeling them entirely. Love how that egg wash finishes the crust. Peach Tart recipe includes step-by-step instructions for making your own crust, although you are certainly a-okay to go with refrigerated dough to save time. This is the recipe Harvey, the grandog approved. 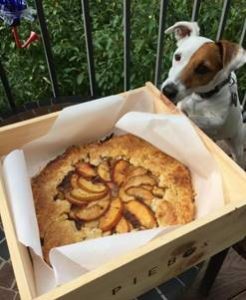 Peach Crostata recipe is also yummy. Only thing we might change next time we make it is to add a bit of cinnamon. The peach slices lend themselves to a nice fan arrangemnt – so maybe it is a bit of fancy to go with the rustic look overall.